In 1801, well in advance of the Napoleonic Edict of Saint-Cloud (promulgated in 1804 and extended to Italy only two years later) which banned burials inside towns, the abolished Carthusian monastery of Bologna was transformed into a modern municipal cemetery meeting the latest hygienic-sanitary and also political-social demands. The establishment of the new cemetery stirred up intense controversy on the decision – not yet required by any law – for such an “estrangement” of the dead from the city, and above all the suitability of arranging “mass interments” in the Certosa areas, the only differentiation envisaged being by gender and age, in accordance with the most modern Jacobin principles of equality. In the early 19th century, Bologna therefore found itself at the centre of a great ideological and cultural debate, assuming international proportions at the time, on the value of remembrance and the importance of tombs as exempla virtutis. But the intended use of the former monastery soon turned out to be extremely opportune from various points of view, as it combined progressive demands with tradition. Located very far from the city centre, the new cemetery met the very latest hygiene standards, and its location, exactly midway between the city and the Virgin of St. Luke sanctuary – a paramount landmark of devotion in Bologna since the 15th century – made it an ideal and inescapable link between earthly and spiritual dimensions. At the same time, its large cloisters, marked by numerous arches intended for the burial of those praised during their lives “for virtue, dignity or any form of study and art”, allowed the aristocrats to maintain their ancient privilege of “distinguished” burial, which against their will they were forced to share with the rich bourgeoisie, the emerging class of Napoleonic society. In contrast to other large early-19th-century monumental cemeteries – notably Père Lachaise in Paris – which were mainly of landscape inspiration with tombs and monuments scattered through greenery, Bologna cemetery was the most complete expression of the neoclassical spirit. With a clear prevalence of “constructed architecture”, its monumental part was almost exclusively roofed, consistent with the tradition of sepulchres in churches, in perfect consonance with the philosophical and literary demands of which Foscolo’s poems formed the pinnacle. In 1802 it was already obvious that the cemetery area – then organised on the basis of architect Ercole Gasparini’s great plan with the 16th century Chapel Cloister as its centre of expansion – would be insufficient within a decade or so. After the work of Angelo Venturoli, who designed the Hall of Mercy (adapting the former refectory of the Carthusians and connecting it with the cellar below by means of a large elliptical opening marked by an elegant cross-ramp staircase) and the Hall of Tombs, a long room with an arched ceiling, the cemetery area was greatly enlarged in 1822 with the construction of the great Large Cloister. In the following decades, architects Luigi Marchesini and Giuseppe Tubertini adapted additional areas for burials, as did Coriolano Monti, Antonio Zannoni and Antonio Dall’Olio in the second half of the century. In the early 1900s, the cemetery was enlarged mainly to the east, where significant architectural work was carried out as a late, fascinating expression of the eclectic style: the 1920s saw a new monumental entrance by Roberto Cacciari and Enrico Casati, and in 1933 the memorial to the fallen of the Great War (designed by Filippo Buriani and completed by Arturo Carpi) was inaugurated, built within Giulio Ulisse Arata’s grandiose monument dedicated to those who died in the Fascist revolution and inaugurated just one year earlier. Sadly, twenty years later there was once again the need to celebrate the dead. In the second half of the 1950s, a distinctive ossuary monument by Piero Bottoni dedicated to fallen partisans was erected, an imposing neo-Corbusier work of strong visual impact. As has been noted repeatedly, Bologna Certosa Cemetery houses one of the great sculpture collections of the last two centuries. In particular, it contains the richest display of Italian neoclassical art, and it is not hard to imagine that, especially in the early decades of the 1800s, it was a sort of major “worksite-museum” that fostered exchanges of view and comparisons among the numerous architects, modellers and painters working on the tombs of illustrious Bolognese. 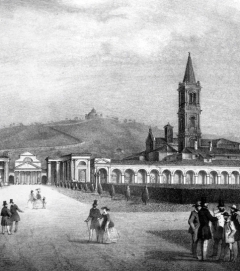 It should not, therefore, be surprising that Certosa was defined by the writer Aleksandr Turgenev as a "Cemetery which can be called a museum" (1834). In the first 15 years of the 19th century, in accordance with Bologna’s pictorial and scenic tradition, the tombs created in the arches of the Chapel Cloister were mainly decorated by painters. As of the mid 1910s, this phenomenon - perhaps unique worldwide – was replaced by sculpture, first and foremost due to difficulties in conserving such outdoor works, but also as a result of a slow change in taste to the neoclassical style. Its implementation in Bologna, the capital city of Emilia, was owed to the great dedication of the Piacenza-born scholar Pietro Giordani, who had been prosecretary of the historic Bologna Academy of Fine Arts from 1808 to 1815. Subsequently it was primarily local modellers - who were aware of great neoclassical funerary sculpture (Canova in particular) and also highly respectful of the styles and technical virtuosity characteristic of the late Baroque Bolognese tradition - who were awarded the majority of commissions for monuments to be erected at Certosa. Like all monumental cemeteries, Certosa is a privileged observatory for anyone planning to study 19th and 20th century sculpture. Whereas in the early 19th century sculptors had opportunities to work in churches and noble residences, those opportunities gradually declined, and other than the public monuments of the post-unification and post-war eras, sculpture had few other venues. The list of artists – some internationally famous, others of only local repute– who enriched the Bolognese cemetery is a very long one, and here we may only limit and highlight through their work the evolution of styles and taste and the expression of the succession of social and cultural changes. In the early decades of the 19th century, funerary works were above all examples of the uniquely Bolognese desire to adapt iconography to great neoclassical models, with a strong link to local artistic traditions based on rich materials and Baroque theatrical values. Formal simplification based on purist style came only in the late Restoration era, perfectly in line with contemporary political-cultural demands and accompanying the increasingly widespread prevalence of religious symbols in place of secular and Masonic symbols. In the latter half of the century, this stylistic trend merged with a realistic representation of life and death that led to a new, albeit different, eclipse of religious iconography: funerary monuments became an important means of self-celebration of the modern entrepreneurial class, through which the economic success it had achieved was displayed. Towards the end of the century, the emergence of symbolist tendencies, to be interpreted in the context of the crisis in positivist certainties and the widespread development of new decadent spiritualist orientations, gave rise to religious and profane figurations characterised by an ambivalent and mystical aura, often associated with the symbolic values and mystery typical of the floral repertoire typical of elegant Liberty monuments. Following the First World War, the will to celebrate patriotic love and heroism dominated, taking form particularly in grandiose monuments to the fallen, a sublime merger of architecture and sculpture. Throughout the fascist era, models and styles of classicist reminiscence were promoted, almost as if to build an ideal bridge between modern times and the Roman antiquity to which contemporary Italian culture traced its origins and intended to reconnect. Even in a “place of remembrance” like Certosa, concepts of vitality such as physical health and sport were often extolled with great formal conciseness. But after the Second World War, different secular and social themes prevailed, such as work and the horrors of war. More recently, the custom of erecting large funerary monuments has disappeared in favour of generally undifferentiated architectural development, which better corresponds to the simultaneous exorcism of death and resulting widespread disinterest for places of remembrance and its rituals. The historic Bologna cemetery, like many others, thus seems to have lost the “artistic worksite” and “museum in the making” quality which has characterised it since its establishment.